Granny Vee‘s suggestions for a “hippity-hoppity-happity” birthday! A special song, a video, cakes, and a game! A “hippity-hoppity-happity” SONG to celebrate the BIRTHDAY CHILD! A hippity-hoppity-happity birthday to you! Happity birthday to you, to you! Order the whole CD or order the DVD below to show at your party! ♥ THE DVD – 30 minutes of fun! You can make bunny cakes from cupcakes! Take a photo of Buttons and Bows to your bakery. ♥ Play “Pin the Tail on the Bunny”. 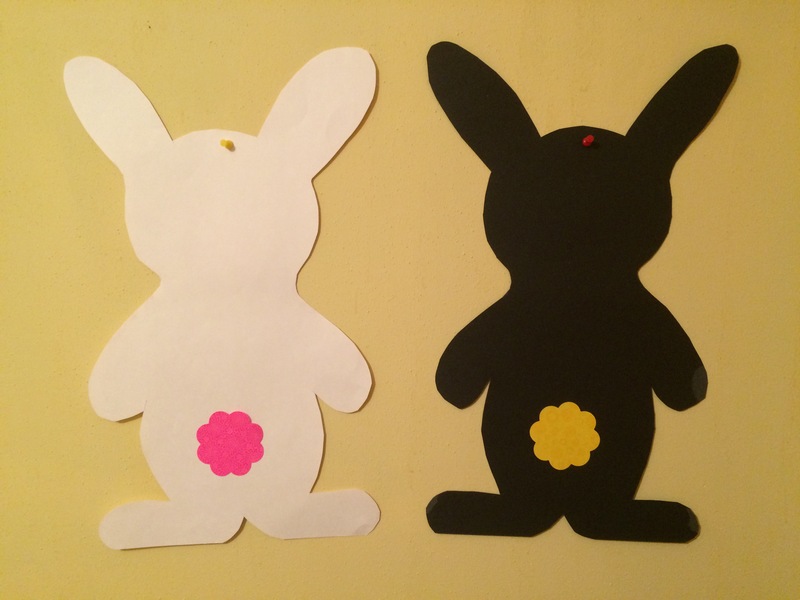 Cut out a bunny shape out of posterboard. Use the Post-It notes that are shaped like a cottontail. You can write each child’s name on the Post-It before they try to “pin” it on the bunny, blindfolded. Have fun! Or use cotton balls with tape for the tail. ♥ PARTY FAVORS: Bunny ears, buttons for the boys, bows for the girls. ♥ Do “The ZOO Song” as a fun activity! Give the children animal masks to wear. And have them do the actions as the song describes! See the lyrics here.